NYCT Bus Time shows the real-time location of buses on two routes in New York. 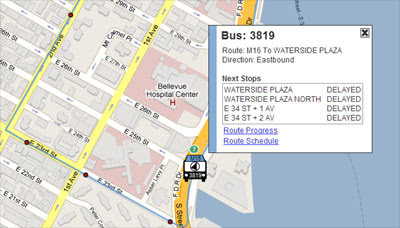 The map displays the M16 and M34 routes and the live position of buses along the route in Manhattan. It is possible to click on any of the bus-stops on either route and get information about the arrival time of the next bus. If you click on the bus map markers you can get the arrival time of the bus at the next four stops on the route. If you are a map developer and you think you could do better then you will be pleased to learn that the data for the NYCT Bus Time Map is also available through an API. Currently the API is only available as a demo and the demo ends on August 10th, so the data stream will be cut off on that date. However that should give you ample time to demonstrate your map building skills.